Available from: IndieBound, Amazon, Barnes and Noble, and maybe your local library. (If they don't have it, you could ask them to order it, and they probably will! That would be awesome.) Also available at many independent bookstores, including Mountain Fold Books in Colorado Springs and the Colorado College bookstore. 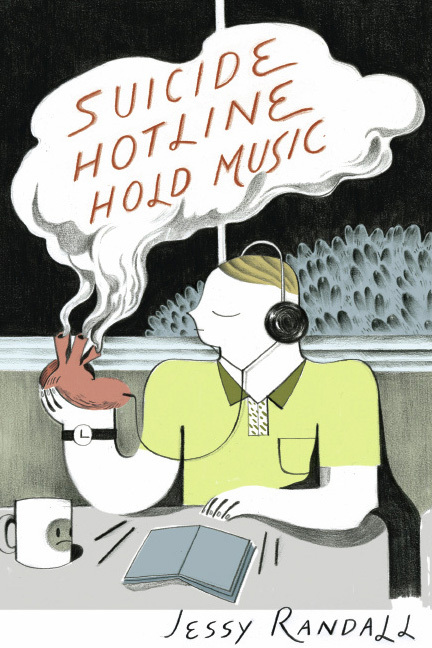 Suicide Hotline Hold Music is a collection of poems (mostly short ones) and poetry comics (poorly-drawn mostly-text sometimes-funny things). A human pretends to be a machine in order to provide comfort anonymously. We are made to consider the epic meaning of middle school pantsing. Hearts are broken and mended. Children play with My Little Robot Pony. A troll keeps a food diary. Everyone’s hair has a sound effect. "You might be wondering what the hell is going on. There was the Big Bang and now we have all this crap. Jessy Randall’s poems will help. Funny, playful and vibrating magic from the quotidian, these poems and comics, if they don’t solve all universal riddles for you, will reintroduce wonder to your heart.” -- Scott Poole, house poet for Public Radio International’s Live Wire! Panorama of the Mountains compares the book to Kate Beaton's Step Aside, Pops and Shel Silverstein's Where the Sidewalk Ends. Dream of the Avant-Garde song version composed and recorded by David Kay as part of his "Dumb Poems for Smart Phones" project. Sample comics in FemGeniuses, Rattle, and Scud. Readings in New York NY, Los Angeles CA, Greensboro NC, Boulder CO, Ridgeway CO, and Colorado Springs CO.